By Keith Cowing on March 30, 2007 5:08 PM. "NASA is serious about using Second Life as a frontier for collaboration and technology, said Jessy Cowan-Sharp (a.k.a. DragonFire Kelly) of Ames Research Center. "If you look at the functionality of Second Life, it's really just a set of tools that you can do whatever you want with," she told MSNBC.com. "There's so much more going on with Second Life than games."" By Keith Cowing on March 30, 2007 12:11 PM. "I will be frank. Educators, and I include myself, for I have spent many years as an adjunct professor at various institutions, are far less certain how to teach "generalship" than we are of how to teach the laws of thermodynamics. And yet it is clear that an understanding of the broad issues, the big picture, is so much more influential in determining the ultimate success or failure of an enterprise than is the mastery of any given technical detail. The understanding of the organizational and technical interactions in our systems, emphatically including the human beings who are a part of them, is the present-day frontier of both engineering education and practice." By Keith Cowing on March 30, 2007 11:58 AM. "The first video from the Defense Advanced Research Projects Agency (DARPA) Orbital Express on-orbit demonstration is now available for viewing on-line. The video depicts the global mated survey of the two spacecraft by the arm camera. 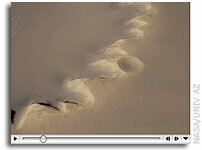 The video was created from 1,600 still pictures taken by the camera on March 28." By Keith Cowing on March 29, 2007 4:34 PM. "The double sunset that Luke Skywalker gazed upon in the film "Star Wars" might not be a fantasy. Astronomers using NASA's Spitzer Space Telescope have observed that planetary systems dusty disks of asteroids, comets and possibly planets are at least as abundant in twin-star systems as they are in those, like our own, with only one star." By Keith Cowing on March 29, 2007 4:31 PM. "Hope and good intentions by themselves are not going to be sufficient to ensure success," added Chairman Udall. "We are going to need commitment, accountability and ultimately, effective performance by all involved...and I am troubled by indications that all may not be going as well as hoped with the NextGen effort." By Keith Cowing on March 29, 2007 12:45 PM. "China and Russia will mount a joint effort to explore Mars and one of its moons in 2009, Chinese state media reported on Wednesday following an agreement to boost cooperation between the two ambitious space powers. A Russian rocket will lift a Chinese satellite and Russian exploration vehicle to survey Mars and Phobos, the innermost and biggest of the red planet's moons, the China Daily reported, citing China's National Space Administration." By Keith Cowing on March 29, 2007 11:47 AM. "Griffin wants NASA to be thought of in the same manner as the Navy, Air Force and other government units. "We don't debate if we will have a Navy," he said. "But every year we always seem to debate if we will have a space program." "I have to make a choice between putting people into space or having the ability to put people into space or supporting them in a better means when they are in space. To do the second prior to the first seems to me to be logically bankrupt," Griffin said. Purdue is experiencing the funding cut first hand. Purdue's NASA Specialized Center of Research and Training in Advanced Life Support will close at the end of this year." By Keith Cowing on March 29, 2007 11:39 AM. Editor's update: I spoke with DARPA PAO and they will be providing me with additional information. Suffice it to say that after some software uploads, ASTRO now controls the Orbital Express stack. However, an anomaly earlier in the mission having to do with ASTRO's reaction wheels seems to be at the heart of the spacecraft's earlier problems. Editor's note: Check out this Orbital Express status page at Boeing. What is being downplayed here, according to sources, is the fact that Ball's NextSat spacecraft has been controlling the stack (NextSat/ASTRO) since arriving on orbit last month due to the fact that Boeing's ASTRO spacecraft experienced a series of on-orbit anomalies due to GN&C software and hardware problems. Indeed, were it not for NextSat, Boeing's portion of the spacecraft would not have been able to orient the solar arrays properly - and power itself. This is a cool mission. It is also an expensive one. I certainly hope things get fixed. By Keith Cowing on March 29, 2007 10:28 AM. Editor's note: Last week, NASA Watch reported "Tony Lavoie, who had served at MSFC as NASA's Lunar Precursor and Robotic Program Manager, has been reassigned. No formal replacement has been announced. Nor has NASA PAO replied (yet) to an inquiry I submitted yesterday regarding this move." I heard from HQ PAO on Wednesday. When I asked if Lavoie had been reassigned - and if so, what his new job was - PAO said "We do not comment on personnel matters". When I asked who the current head of the Lunar Precursor and Robotic Program was, PAO again declined to answer personnel questions, and suggested that I contact MSFC PAO. Does NASA ESMD really not know who is in charge of this activity at MSFC? I doubt it. Must be that dang Operating Plan again. So, how about it, MSFC PAO, help me out. "Who" is running "what" down there? Alas, if you check This link for the Lunar Programs & Projects Office at MSFC, which says that it was "Last Updated: 31 December 1969. ", (screen grab of page before it was fixed) all seems to be well - Heck, RLEP-2 is mentioned, yet there is no mention of mission cancellations, etc. So maybe this is all just a lot of noise and armwaving after all. Oh yes - the NASA Watch Bad Internet Security Award for today goes to the people who run this page. Click on either 2007 News Articles Archive or 2006 News Articles Archive. 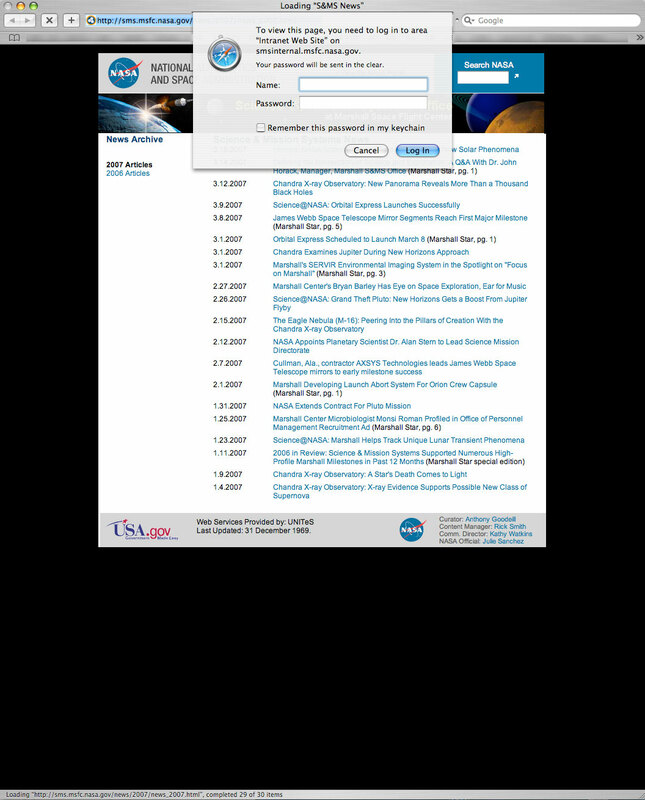 In both cases, the page opens - and after it has opened a username/password box drops down which says "To view this page, you need to log in to area "Intranet Web Site" on smsinternal.msfc.nasa.gov.". Well, since you can already read the page, just click "cancel" and this pointless box will disappear. (See this screengrab to see what happened before the MSFC folks fixed it this morning). Please tell me how this username/password box limits access to this page? This is not security, it is an annoyance. Also, isn't it a sad state of affairs when security screw ups like this only get fixed when NASA Watch makes mention of them? By Keith Cowing on March 28, 2007 12:44 PM. "Eccentric Washington telecommunications mogul Walter C. Anderson was sentenced yesterday to nine years in prison for failing to pay $200 million in taxes -- but a federal judge ruled the Internal Revenue Service won't be repaid for now because prosecutors botched the plea agreement. ... Before the guilty plea, Anderson had insisted that the hundreds of millions of dollars in assets the government said he had hidden belonged to the Smaller World Foundation. He controls the foundation and endowed it with full ownership of various companies he also runs, such as Space Inc. and Iceberg Transport SA. He said he planned for the foundation to begin giving away money in 2006 to promote such causes as world peace, family planning and space exploration, but then he was arrested." By Keith Cowing on March 27, 2007 12:53 PM. "The $100 million for the political party conventions - $50 million for the Democratic convention in Denver and $50 million for the Republican convention in St. Paul, Minn. - is included in a section described as "Katrina recovery, veterans' care and for other purposes." S.965: "$100,000,000 shall be for reimbursing State and local law enforcement entities for security and related costs, including overtime, associated with the 2008 Presidential Candidate Nominating Conventions, of which $50,000,000 shall be for the city of Denver, Colorado and $50,000,000 shall be for the city of St. Paul, Minnesota." Editor's note: The next time you ask your Congressional representatives why they don't support adequate funding for NASA (or other things), you might want to bring this little gem up. It would seem that some politicians view the subsidizing of a week of parties, receptions, and wearing silly hats for political loyalists as being far more important than [insert your concern here]. Given the hundreds of millions of dollars that will be raised for the 2008 election - most of which will be spent on attack ads - shouldn't the political parties be called upon to pay for all this extra security? By Keith Cowing on March 27, 2007 11:02 AM. "Dear NASA Watch: My name is Carolyn Bushman. I teach at Wendover High School, Utah's only NASA Explorer School. Wendover has 180 7-12 grade students. Last year I had the opportunity of taking students to the Wallops Fight Facility to see their experiment fly on an Orion Rocket. I met Pamela Ghaffarian of Franke Park Elementary, Multiage Classroom and she told me how NASA Watch had helped get her students to Wallops Well this year I'm facing a similar dilemma Due to cut backs the sub-sem is no longer happening, but the NES brought my attention to a new opportunity of having an experiment flown out of New Mexico. My students submitted an experiment and got it accepted." Reader note: Keith, I work for the Space Shuttle Program at MSFC and would like to donate $500 towards the cost of this trip. I know how much this type of trip would have meant to me during my high school years. Continue reading Another School Needs Help. By Keith Cowing on March 26, 2007 9:16 PM. By Keith Cowing on March 26, 2007 4:03 PM. "Rep. Nick Lampson, who replaced former Majority Leader Tom DeLay in the House, underwent quadruple heart bypass surgery over the weekend and is recovering in a Houston hospital." By Keith Cowing on March 26, 2007 11:18 AM. Editor's note: Word has it that an Airbus 380 - which landed at Dulles Airport last night - will be doing a flyover up, down, and around the Potomac and Washington, DC today between 11:15 and 12:30. The idea is to get photos of this uber monster plane set against the U.S. Capitol building - thus rubing our collective noses in this accomplishment (I suppose). Heads Up Lisa Porter - competition overhead! Editor's 11:18 am EDT note: I just saw this monster fly over my house (I live close to Dulles) heading Southeast toward Washington. It looks to be the size of a C5A - but much more graceful. By Keith Cowing on March 25, 2007 12:24 PM. "Jonathan Goff, a 26-year-old rocket engineer, climbed atop a mound of titanium spheres once used to store highly explosive liquid oxygen rocket fuel and scanned the area for used rocket parts. "This is definitely a cool place," he said. For almost five decades, Norton Sales Inc. in North Hollywood has been collecting the nuts, bolts and heat exchangers from the rockets that helped American astronauts shrug off the steely embrace of gravity. This is where the bits and pieces of America's space program came to die." Editor's note: Its great to see that some people actually try to use this engineering legacy - one taxpayers poured an enormous amount of money into - instead of buying these artifacts as props for their den (or their garage) - where they can serve no future purpose. By Keith Cowing on March 25, 2007 11:53 AM. "The YES2 project involves more than 400 students from across Europe and around the world. The satellite is scheduled to be launched by a Soyuz rocket in September 2007, piggybacking on ESA's Foton-M3 microgravity mission. One of the most important aspects of this innovative mission is the deployment of a 30 km long tether to deploy the Fotino mini-satellite and re-entry capsule. . Not only will this be the longest artificial structure ever deployed in space, but it will also be the first time that a tether has been used to return a payload from space. The flight is intended to demonstrate how such a tether can be used to change a satellite's orbit without attitude control systems or rocket engines." Editor's note: Today's YouTube Videos: YES2 MDU integration - Day 1 - First day of the integration of the Mass Dummy Unit of the ESA second Young Engineers' Satellite. Continue reading Students Build Longest Structure Ever To Be Launched. By Keith Cowing on March 23, 2007 4:27 PM. "Last year, NASA night almost broke out into a giant brawl after Mary Cleave spoke about how she didn't understand why we were angry after the announcement of major cuts to Research and Analysis (R&A) funding. Good times. I think we must have scared her off -- she, who is retiring in April, didn't show her face in Houston. Instead we were treated to Jim Green, the new head of planetary sciences, who was honest and sympathetic and actually listened to what we had to say. It was incredible." By Keith Cowing on March 23, 2007 3:47 PM. "Tethers Unlimited will launch the MAST Experiment March 27 on a Dnepr rocket. The Multi-Application Survivable Tether (MAST) will be the secondary payload. The MAST experiment consists of three staked picosatellites. Once on orbit, the picosatellites will separate and deploy a 1,000 meter (1 KM) long Hoytether structure." Who Am I Speaking to Again? By Keith Cowing on March 23, 2007 12:16 PM. "Good morning. Thank you for inviting me to speak here again this year. The American Astronomical Society's annual Goddard Symposium is one of those events I look forward to each year, an opportunity for all of us to catch up with old friends." By Keith Cowing on March 23, 2007 11:07 AM. Editor's note: Reliable sources report that Tony Lavoie, who had served at MSFC as NASA's Lunar Precursor and Robotic Program Manager, has been reassigned. No formal replacement has been announced. Nor has NASA PAO replied (yet) to an inquiry I submitted yesterday regarding this move. Meanwhile, it seems that Sen. Shelby (R-AL) is up to his old habits again and is trying to pressure NASA to change its decisions (without much success this time) - as outlined in its yet-to-be-released Operating Plan. Stay tuned. By Keith Cowing on March 23, 2007 12:57 AM. Editor's update: I came across this image from the ISS crew tonight. The caption says "Astronaut Sunita L. Williams, Expedition 14 flight engineer, takes a snack break near the galley in the Zvezda Service Module of the International Space Station." So ... are those three trained banana slugs sitting side by side on that chocolate covered graham cracker (or frosted brownie) - or is it just very precisely applied peanut butter? Or (yuck): cheese from an aerosol can? Or is it some Russian glop from a tube? Help me PAO ... I have to know. Gee, I wonder what Martha Stewart thinks of this - the presentation is a little off. Throw that pastry chef out of the airlock! Editor's update: NASA PAO checked with the ISS crew: the substance on top is peanut butter - and the item underneath is a brownie. "The menu for the meal, which was prepared by Alain Ducasse's consulting and training center, ADF, was selected by Dr. Simonyi's friend Martha Stewart." Continue reading Mystery Snacks on ISS. By Keith Cowing on March 22, 2007 3:17 PM. Effective today, Bob Jacobs is serving as acting deputy assistant administrator for public affairs. Bob will be in charge while I am on vacation, beginning tomorrow (Friday). I'll be back in the office April 2. Please contact Bob or Jason Sharp with anything that needs attention during that time. Bob has been effectively serving in this capacity, in addition to news chief duties, since Dean and Doc departed. I'm pleased to have him in the capacity officially. Thanks for everyone's support as we move forward. By Keith Cowing on March 22, 2007 3:16 PM. "Former astronaut Lisa Nowak's attorneys formally entered a not guilty plea Thursday to charges that she tried to kidnap a rival for a space shuttle pilot's affections. Nowak's trial is scheduled to begin July 30 on charges of attempted kidnapping, burglary with assault and battery." By Keith Cowing on March 22, 2007 10:29 AM. "An explosion on a nuclear submarine which killed two British sailors was caused by an emergency oxygen device, the US military has said. ... Oxygen candles are emergency devices that create oxygen through a chemical reaction. Some devices burn at high temperatures during the reaction." By Keith Cowing on March 21, 2007 11:14 PM. "You never got to float around the room in high school. Now the state of Florida plans to fund this so called no gravity classroom every year. "We're putting together a microgravity educational research institute," Space Florida CEO/President Steve Kohler said. The classroom is a modified 727 run by the company Zero G. The pilot climbs steeply and dives to create about 30 seconds of weightlessness." By Keith Cowing on March 21, 2007 9:51 PM. "First, I think one of the systemic problems the space community faces is the inability to set realistic expectations. We speak in lofty terms about the goals we seek with our space missions, and we should, but let me speak now about some brass tacks. Every time NASA or the scientists and researchers we support have low-balled a cost estimate or over-promised on the technical feasibility of a project or program, we have lost credibility with our overseers in the White House and Congress, and, more importantly in the long run, the American people. As a matter of public policy, we as a nation do not seem to be willing to provide sufficient money for NASA to do everything that everyone would like us to do. Thus, we must make carefully considered choices." By Keith Cowing on March 21, 2007 6:10 PM. Editor's update: Word has it that NASA intends to cancel funding for NIAC the NASA Institute for Advanced Concepts. This is just plain stupid. Let me repeat this for clarity's sake, Mike, (whoever made it) this is A STUPID DECISION. Advanced spacesuits that will open the surface of the moon - and then Mars- to meaningful and productive human exploration, tethers and other innovative and upmass-saving technologies, and other in-space techologies. Where are you going to get all of the things you need to put on those Ares rockets so as to allow their crews to carry out their missions, Mike? Or do you "just need a good map"? Explorers without the right tools die - or turn around - and head back home. Wrong answer, Mike. "But Keith Cowing, editor of the independent website NASAWatch, which broke news of the likely shutdown on Tuesday, says it does not make sense for NASA to cut funding to the institute. "This is one of the few places at NASA that embodies far-thinking, new stuff," he told New Scientist. "When they're cutting stuff like this, they're desperate, or stupid, or both." "We're hearing word that NASA is planning to kill off its way-out research arm. "This is just plain stupid," say the long-time space observers at NASA Watch. For sure. $3 million is a piddling amount of money for $16 billion organization." "Former Nasa scientist Keith Cowing said the decision to close Niac was "just plain stupid". Writing on his Nasa Watch website, he directed comments to Nasa's administrator, Mike Griffin: ..."
By Keith Cowing on March 21, 2007 11:00 AM. "The House Science & Technology Committee's Subcommittee on Energy and Environment will hold a joint hearing along with the Energy & Commerce Committee's Subcommittee on Energy & Air Quality to receive testimony from Former Vice President Al Gore and others on global climate change. 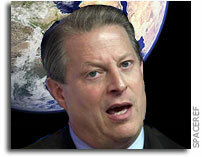 The hearing titled "Perspectives on Climate Change," will be held Wednesday March 21, 2007, at 9:30 a.m. Vice President Gore will appear as the witness on the first panel. Dr. Bjorn Lomborg, Adjunct Professor, Copenhagen Consensus Center, Copenhagen Business School will appear on the second panel." By Keith Cowing on March 20, 2007 6:11 PM. "Based on our recent email exchange and your invitation to, "Send us your specific criticisms, or come in and talk, either way, and we will hear your concerns, and respond" I have put together an independent analysis for your consideration. What I attach is approximately a parallel analysis of the various alternatives for diverting a threatening NEO to that which NASA submitted to the Congress. In it I provide the basic logic and resultant conclusions and then juxtapose them with the NASA response commenting on why the apparent difference." By Keith Cowing on March 20, 2007 4:34 PM. "A former astronaut arrested on charges of trying to kidnap a rival for the romantic affections of another astronaut could face trial in late July in Florida, the State Attorney's Office said Tuesday. Lisa Nowak's trial has been scheduled for a two-week period starting July 30, said Danielle Tavernier, a spokeswoman for State Attorney Lawson Lamar." By Keith Cowing on March 20, 2007 10:43 AM. "As you consider the fiscal year 2008 (FY08) Appropriations for the National Aeronautics and Space Administration (NASA), the International Federation of Professional & Technical Engineers (IFPTE), NASA's largest federal employee Union, urges you to provide adequate funding to allow NASA to successfully perform its assigned missions. We specifically request that NASA's top line be as close as possible to $18.3 billion dollars, a billion dollar plus-up from the President's request, in order to meet its broad range of responsibilities to the American people." By Keith Cowing on March 20, 2007 10:35 AM. "Lunar Robotic Precursor Program--NASA indicates that funding will be eliminated for any lunar robotic missions that were to follow the Lunar Reconnaissance Orbiter (LRO) and its accompanying payload--the LCROSS--which is scheduled to launch in October 2008." "The Red Planet venture capital fund program, which was modeled on CIA's In-Q-Tel program, is eliminated in this budget request." Continue reading NASA budget Casualty List Grows. By Keith Cowing on March 20, 2007 9:57 AM. "NASA has begun to produce a series of downloadable videos - "Vodcasts" aimed at a younger, hipper audience than is normally the case at NASA. I just had a look at one of these vodcasts (NASA EDGE Show 2). I have to say that it is is well done and surprisingly spontaneous for a NASA program - and I would suspect, it is also a bit more approachable for younger audience than standard NASA TV fare. I hope these guys are able to keep up the quality and the spontaneity and produce more of these vodcasts." By Keith Cowing on March 20, 2007 12:01 AM. "The X PRIZE Foundation is always looking for new ideas around what people consider to be the largest, most challenging issues facing humankind today, and this is our "soap box" for you to be heard. Tell us what grand challenges you think the world ought to be thinking about. And while we're interested in the opinions of individuals, we're also interested in the opinions of the group. An X PRIZE committee will review the videos that receive the most votes to determine a winner." By Keith Cowing on March 19, 2007 4:53 PM. Editor's note: Have a look at this cartoon. NASA's public image is changing as a result of recent events. By Keith Cowing on March 19, 2007 3:15 PM. "NASA scientist James Hansen is one of the nation's most esteemed experts on climate change. George Deutsch is a young and inexperienced former NASA public affairs officer who was tasked with managing the public statements of Dr. Hansen and other NASA scientists. Today. we will hear from both of them about their experiences." "... These orders were delivered orally, as usual, as was a threat of "dire consequences" if I did not comply. However, a new young political appointee at Public Affairs, apparently was not well-schooled in the rules and left a paper trail, including a description of a specific instance in which Public Affairs barred me from speaking to NPR, offering the Associate Administrator in my stead." "Subsequently, several media reports accused NASA political appointees and others of censoring Dr. Hansen. I can only speak for myself and my time at NASA. I never censored Dr. Hansen, and I do not believe others at NASA did either." By Keith Cowing on March 18, 2007 9:50 PM. "China plans to mount a head-on challenge to the dominance of Boeing and Airbus in the global market for big passenger jets by setting up a state-owned company to build the aircraft. A statement on the government's website issued late on Sunday said the state council the cabinet had taken an "important strategic decision" to begin research and development to enter the market." "I cannot speculate and won't speculate on what China's intensions are. I just don't know that," said Griffin. "As a matter of technical capability and political will, if the Chinese choose to do so, they can mount a lunar mission within a reasonable number of years, say a decade." By Keith Cowing on March 17, 2007 11:02 AM. Editor's update: Yesterday (Friday) morning, NASA PAO refused to comment on the record to me about the new operating plan or changes in the LPRP (see quote below). Yet a few hours later NASA PAO is quoted on space.com and the Huntsville Times answering the very same questions I asked hours before - questions that were specifically not answered. Something fishy is going on here. Reliable sources report that this LPRP move is not just a budget driven decision There are also issues of technical competence - and overall VSE implementation philosophy at work as well. Ask yourself this: how much time has been lost (and money wasted) moving these lunar program and project offices around the country every few months - and why was this done? Word has it that Mike Griffin is very dissatisfied with the technical expertise (or lack thereof) at MSFC. Of course he also felt this way about GSFC and ARC at one point or another. One look at comments made by Mike Griffin and Scott Horowitz (see below) is clear evidence of their lack of interest in any precursor lunar robotic missions. Indeed, they feel that all NASA needs for human missions is a "map" (of the moon). In addition, there is a clear budget component to this current move. By cancelling or descoping these robotic missions, money is freed up to cover nagging problems that Griffin and Horowitz feel they need to attend to i.e. Ares 1 and Orion. Editor's 15 Mar note: Word has it that the LPRP office at MSFC is either being totally shut down or dramatically reduced in size with lunar mission coordination moving back to HQ (after making a cross country tour from GSFC to ARC, then MSFC). Meanwhile, contracts are being terminated for robotics work given that the number of post-LRO robotics programs has begun to shrink rather dramatically. It is almost certain that such changes will be reflected in the agency's new Operating Plan. According to NASA PAO: "NASA hopes to be sending the draft Operating Plan to Congress for review this week. By law, Congress will have 15 days to review this draft and send comments back to NASA. After we [NASA] have worked with Congress and the final Operations Plan is in place, NASA will be able to discuss specific aspects of the plan. It would be inappropriate for NASA to comment on draft version of this plan as they are circulated on Capitol Hill for congressional review." "Scott Horowitz, NASA's exploration chief, says that those robotic missions would be nice to do--if the agency had the money. All he really needs, he told the scientists, is "a damn good map," which LRO will provide. He made it clear his interest is not in blue-sky research. "We don't have to get rocks back." "Among the actions NASA recommends in its fiscal 2007 operating plan is shutting down the Lunar Precursor and Robotic Program Office at Marshall Space Flight Center, where a whole generation of unmanned orbiters, rovers, hoppers and penetrators was under consideration as scouts for a human landing on the moon." Continue reading Lunar Precursor Robotic Program Changes Ahead. By Keith Cowing on March 16, 2007 8:48 PM. Senator Mikulski called for a bipartisan, bicameral space summit with the White House. She cited a similar meeting 17 years ago, with then President George W. Bush and Vice President Dan Quayle, which paved the way for the creation of the Mission to Planet Earth. "There is no more visible sign of American global leadership than our space program. To lose that position to other countries would be a tragedy," said Senator Mikulski. "We need a new dialogue with the President and his administration. We need a national commitment to our space program to put it on a path for success. Only through the active cooperation of the White House and the Congress, can we have a healthy, robust and balanced space program." By Keith Cowing on March 16, 2007 10:20 AM. "In the wake of the Hansen story, NASA adopted a new media policy that was designed to provide some protections to scientists enabling them to talk about their work. Following the release of that new policy, the Director of the Office of Science and Technology Policy (OSTP) Dr. John Marburger, wrote to all the federal agencies conducting science and shared a copy of the NASA policy, encouraging them to review their rules and consider adopting like standards as needed." By Keith Cowing on March 16, 2007 9:38 AM. "Finding room for lunar research in NASA's $5.4 billion science budget is one of many challenges facing Alan Stern, who next month takes over the troubled program. He's a planetary scientist from the Southwest Research Institute in Boulder, Colorado, and a one-time astronaut candidate. Last week, during a meeting with the National Academies' Space Studies Board, Stern pledged to wring more science out of a flat budget and find ways to ease controversial cuts to university grants." By Keith Cowing on March 16, 2007 9:32 AM. "The Alpha Magnetic Spectrometer (AMS) is a model of international cooperation, led by a dynamic Nobel Prize winner, and promises to do impressive science in space. But it may never get a chance to do its thing. The problem is that NASA has no room on its space shuttle to launch the $1.5 billion AMS mission, which is designed to search for antimatter from its perch on the international space station. "Every shuttle flight that I have has got to be used to finish the station," NASA Administrator Michael Griffin told a Senate panel on 28 February." By Keith Cowing on March 16, 2007 7:13 AM. Continue reading ARC's Johnny Green Has Died. By Keith Cowing on March 15, 2007 3:00 PM. "The amount of water trapped in frozen layers over Mars' south polar region is equivalent to a liquid layer about 11 metres deep covering the planet. This new estimate comes from mapping the thickness of the dusty ice by the Mars Express radar instrument that has made more than 300 virtual slices through layered deposits covering the pole. The radar sees through icy layers to the lower boundary, which in places is as deep as 3.7 kilometres below the surface." "Tomorrow, a major scientific journal will publish findings from Mars Express data. 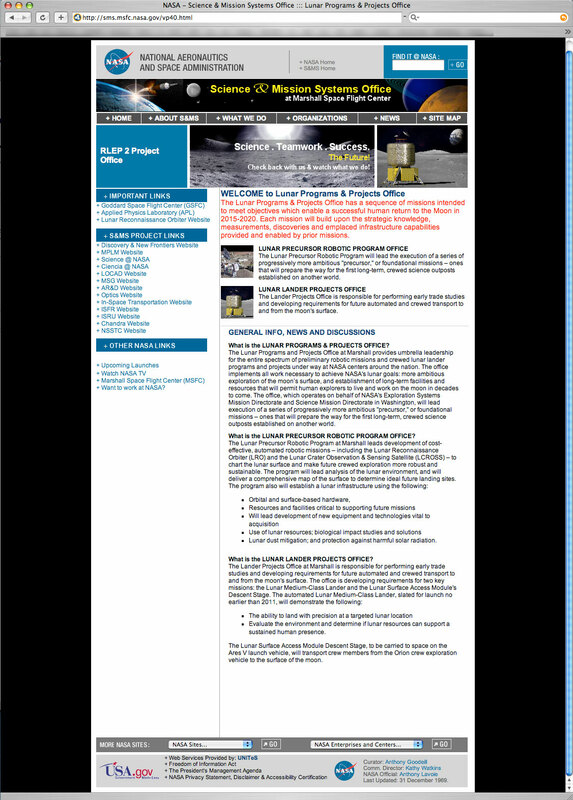 The embargo for this story expires at 18:00 GMT, when ESA will publish the story on its portal: http://www.esa.int"
By Keith Cowing on March 15, 2007 2:33 PM. "In the years since, the Administration requests for NASA have come in lower, and unfortunately Congress failed to fully fund the FY2007 request. Everyone bears some blame for the funding shortfalls, but the point I want to stress is that NASA continues to hold to its original schedule for the Vision, but doing it with smaller budgets. Consequently, the stress on the agency is enormous."" "First, the FY 2008 budget request continues a pattern of Administration requests that fail to ask for the level of funding that the White House had said NASA would need to carry out the exploration initiative and its other core activities. Specifically, in the three years since the President announced his exploration initiative, the White House has cut NASA's five-year budget plan by a total of $2.26 billion. And based on this year's budget submittal, that shortfall will worsen by another $420 million in FY 2009." "I agree with Chairman Gordon's assessment of the situation we are facing. It is going to be a tough year for space and aeronautics supporters to get the budgetary resources NASA needs, but we are going to try. We are going to try because NASA's space and aeronautics programs are a very important component of the nation's R&D enterprise, and we need to be investing more in those areasnot less." "I am deeply concerned that the gap between the retirement of the Space Shuttle in 2010 and our new U.S. human spaceflight systems does not grow longer, and I am asking for your help on this point. Full funding of NASA's FY 2008 Exploration Systems budget request is critical to ensuring the gap between retirement of the Space Shuttle and the new U.S. human spaceflight capability does not grow longer. As the CAIB report observed, "this approach can only be successful... if the U.S. government is... to commit the substantial resources required to implement it." By Keith Cowing on March 15, 2007 2:31 PM. "Less funding than planned for 2007 means that less will be obligated on the Orion contract, slowing the pace of development planned for 2008-10. To the extent that schedules are allowed to slip further into the future for bringing these new Exploration systems on-line, already difficult challenges in transitioning the highly-skilled, highly-specialized workforce from the Space Shuttle to our new systems will be exacerbated." By Keith Cowing on March 14, 2007 11:39 PM. "Yuri's Night is proud to announce that New Horizons, the NASA spacecraft currently en route to the ninth planet, Pluto, and the Kuiper Belt, will begin its final encounter with the Pluto system on April 12, 2015. The year 2015 will be the 54th anniversary of the spaceflight of Yuri Gagarin, the first person to orbit the Earth and the 34th anniversary of the first Shuttle launch. Each April 12, Yuri's Night holds parties around the planet to commemorate these occasions. New Horizons mission PI Dr. Alan Stern will be present at the Yuri's Night Washington, D.C. party to talk more about the mission." By Keith Cowing on March 14, 2007 10:52 PM. "Images taken by the High Resolution Imaging Science Experiment camera on NASA's Mars Reconnaissance Orbiter, provided detailed, three-dimensional information that was used to create this animation of a hypothetical flyover." By Keith Cowing on March 14, 2007 8:59 PM. "Prediction is difficult, especially the future," said quantum physicist Niels Bohr, and no one has since captured the underlying concept quite so cleverly. But having been foolish enough to accept the challenge of speculating upon where the next 50 years will take us in human space exploration, the first question to be answered is, where to begin? What is the global view that can best shape our thinking? It is so very easy to be completely wrong, since a variety of radically different futures in spaceflight can be presumed with equal apparent credibility today." Editor's update: Copies of this article were frantically jumping across the Internet today - with arm waving claiming that this was a "speech" Mike Griffin would soon deliver - somewhere. Wrong. This was an article intended for publication from the onset. Speech texts do not include multiple embeded tables (as the circulated Word file included) - nor are they written as this article is constructed. Moreover, prepared speeches always carry a statement as to where they are to be delivered. By Keith Cowing on March 14, 2007 5:46 PM. "So the story one hears now from most members of Congress, and some in the media, is that the president made a speech about going to Mars in 2004, got nothing but grief for it, and the proposal went nowhere. This is, of course, almost entirely wrong. The bottom line of the president's speech was to return astronauts to the Moon by 2020. That programme has been going forward steadily, albeit with less funding than originally proposed. The president's silence has been, if anything, a strategic retreat that has actually hastened plans for a lunar mission - because few other than NASA's most ardent supporters in Congress are paying much attention." By Keith Cowing on March 14, 2007 9:23 AM. Editor's note: If you look at the website for the International Space Settlement Design Competition it says "Eight Finalist teams are selected to compete in a live Competition at NASA Johnson Space Center in Houston, Texas, with real engineers sharing knowledge and experience." However, this comment online at NASA JSC seems to paint a different picture: "Johnson Space Center is not sponsoring the Annual Space Settlement Design Competition in 2006. Questions about future competitions can be directed to Norman Chaffee at 281-483-3777 or via e-mail at norman.h.chaffee@nasa.gov." So, does JSC support this event or not support it? Continue reading Space Settlement Competition Confusion. By Keith Cowing on March 14, 2007 12:54 AM. "The first-of-its kind, autonomous servicing demonstration satellite launched on Thursday, March 8, 2007, aboard a United Launch Alliance Atlas V rocket from Cape Canaveral Air Force Station, Fla. The three-month space mission is sponsored by the Defense Advanced Research Projects Agency (DARPA)." Editor's note: Word has it that the Ball portion of this mission (Nextsat) is performing perfectly. However, it seems that Boeing's contribution (Astro) is having some problems (shhh!). By Keith Cowing on March 13, 2007 7:41 PM. "That result could prompt Sen. Tom Coburn, R-Okla., to try to block other federal conferences, says Roland Foster, an aide to Coburn. Coburn has been a consistent critic of what he says is excessive spending on federal conferences. ... He cited as an example last week's Planetary Defense Conference 2007, partly funded by NASA, where the agency argued it needs more funding for its program to deflect asteroids headed toward Earth. Such calls, while permissible on Capitol Hill, amount to political lobbying that should be banned at federally funded conferences, according to Foster." Editor's note: Perhaps if this over eager staffer were to have stopped waving his arms for a moment and actually done a little homework - such as reading NASA Authorization Act of 2005: Conference Report - he'd have learned that Congress directed NASA to conduct this NEO study and to make its findings public as well as deliver a report to Congress. NASA was simply following the law as set forth by Congress. Indeed, Congress has already made its mind up on this issue. Also, there are some people at NASA who were not totally thrilled about doing this study in the first place. By Keith Cowing on March 13, 2007 6:17 PM. "The effect of the FY 2007 appropriation is to impose a six-month delay in our ability to bring online NASA's new human spaceflight systems, the Orion Crew Exploration Vehicle and Ares I Crew Launch Vehicle. Due to the cumulative effect of reductions in Exploration Systems to pay for Space Shuttle Return to Flight costs in FY 2005-06, previously underestimated costs to fly the Space Shuttle until 2010, and the reduction from the FY 2007 request reflected in the FY 2007 Continuing Resolution, based on current budget projections, NASA will not be able to meet the 2014 milestone originally called for when President Bush first announced the Vision for Space Exploration." By Keith Cowing on March 12, 2007 4:05 PM. "The May 11 exercise will be Ames Research Center's first ever Center-wide, all-hands, earthquake drill. The exercise, dubbed the Great Worden Quake of '07, (no, I did not select the name) will be a several hour event for most of you and an all day event for many of you. This is a rare opportunity for all of us. This exercise is an order of magnitude greater than any of the previous disaster exercises that we have conducted at Ames in the past. It is my belief that we will all learn a lot, not only from a Center perspective, but also from a personal perspective." Is Planetary Defense a U.S. Issue - or a Global One? By Keith Cowing on March 12, 2007 10:03 AM. "William Ailor of the Aerospace Corporation, a not-for-profit Air Force research group that sponsored the planetary defense conference, said the problem of finding killer asteroids could be solved more easily if more countries were involved. Interest is growing, he said, noting that the European Space Agency is considering a mission called Don Quijote to test ways to deflect an asteroid. "Should one nation, the United States, be responsible for the entire planet?" Mr. Ailor asked." By Keith Cowing on March 10, 2007 12:19 AM. "Section 321 of the NASA Authorization Act of 2005 (Public Law No. 109-155), also known as the George E. Brown, Jr. Near-Earth Object Survey Act, directs the NASA Administrator to transmit an initial report to Congress not later than one year after the date of enactment that provides: (1) an analysis of possible alternatives that NASA may employ to carry out the survey program of near-Earth Objects (NEO), including ground- based and space-based alternatives with technical descriptions; (2) a recommended option and proposed budget to carry out the survey program pursuant to the recommended option; and (3) an analysis of possible alternatives that NASA could employ to divert an object on a likely collision course with Earth." By Keith Cowing on March 9, 2007 2:41 PM. "The committee's overall assessment is that the initial space flight health standards represent a diligent and well-reasoned effort. The approach uses an occupational health model recommended in Safe Passage and provides an analytical framework for enhancing the safety of human space flight." By Keith Cowing on March 9, 2007 11:38 AM. "Scientists return this week to the world's deepest known sinkhole, Cenote Zacaton in Mexico, to resume tests of a NASA-funded robot called DEPTHX, designed to survey and explore for life in one of Earth's most extreme regions and potentially in outer space. If all goes well with this second round of testing and exploration, the team will return in May for a full-scale exploration of the Zacaton system." By Keith Cowing on March 9, 2007 10:34 AM. "Starting March 21, Nowak, a Navy captain, will be assigned to the staff of the Chief of Naval Air Training at Naval Air Station Corpus Christi, Cmdr. Lydia Robertson said." "Nowak returned to navy duty effective March 8, 2007." Editor's note: Gee, that statement has certainly been sanitized by NASA PAO. By Keith Cowing on March 9, 2007 9:08 AM. "The agency said it is technically feasible to meet the congressional goal of identifying most small "near Earth objects" by 2020, but it said it would have to rely on telescopes built for other purposes and on spacecraft being developed by other agencies. It did not address who would fund research on ways to destroy or divert an asteroid before it became a danger." By Keith Cowing on March 8, 2007 8:54 AM. "NOW, THEREFORE, BE IT RESOLVED BY THE LEGISLATURE OF THE STATE OF NEW MEXICO that, as Pluto passes overhead through New Mexico's excellent night skies, it be declared a planet and that March 13, 2007 be declared "Pluto Planet Day" at the legislature." Editor's note: 13 March is the day the discovery of Pluto was announced in 1930 by the IAU. By Keith Cowing on March 8, 2007 8:00 AM. "NASA announced today that Navy Capt. Lisa Nowak's assignment in the space agency's astronaut corps will end Thursday. Nowak, who was arrested last month in Orlando on charges she attempted to kidnap a romantic rival, remains an active duty naval officer. She has been "on detail" to NASA as an astronaut since her selection in 1996." "NASA requested an end to the detail because the agency lacks the administrative means to deal appropriately with the criminal charges pending against Nowak. Because Nowak is a naval officer on assignment to NASA, rather than a NASA civil servant, she is not subject to administrative action by NASA." Editor's note: In other words, after decades of using military personnel as astronauts it never occurred to NASA to put a policy place to deal with such contingencies. What has me wondering is what NASA will do now - and what policies are - or (more likely) are not in place to deal with such a situation when the individual is not active duty military personnel. Its so easy for NASA to just to dump Lisa Nowak (and associated issues) back on the Navy. It would not be so easy to deal with a similar situation involving NASA civil servants. Indeed, with nearly 20,000 civil servants at NASA, it is rather astonishing that no one ever put such capabilities in place - or planned to do so - in the nearly 50 years the agency has been in existence. Is NASA looking into doing so now? By Keith Cowing on March 7, 2007 11:38 AM. "Over 100 of the world's brightest students and professionals in aerospace will come to Ames' Research Park for nine weeks to study and work on projects directly relevant to NASA's mission. This endeavor will strengthen NASA's global leadership in space exploration and support for science, technology, engineering and mathematics education. This will be the first time in ISU's 22-year history that its Summer Session Program is held at a NASA center. Ames can be proud of its leadership in bringing the world's future in space exploration together to chart a revitalized global partnership as NASA leads America's Vision for Space Exploration." By Keith Cowing on March 7, 2007 11:37 AM. "NASA has established a requirements baseline for the Orion crew exploration vehicle, bringing America's next human spacecraft a step closer to construction. The Orion review followed an overall review of requirements for the Constellation Program that was completed in November. Similar reviews are planned later this spring for ground and mission operations systems that will support Constellation launch systems and space flight operations ground infrastructure." By Keith Cowing on March 7, 2007 9:45 AM. Rep. Brad Miller (D-NC), Chairman of the House Committee on Science and Technology's Subcommittee on Investigations and Oversight: "Allegations against Cobb include changing conclusions in IG reports at the request of the agency, derailing investigations and reducing safety audits. Career employees in his own office raised questions about Cobb's independence as an investigator - accusing him of lunching, drinking, playing golf and traveling with former NASA Administrator Sean O'Keefe, another White House appointee." Editor's note: Among the very, very long list of PAC donors to Miller's campaigns: Accenture PAC, AFL-CIO PAC, AFLAC PAC, Airline Pilots Association PAC, American Bankers Association PAC, American Hospital Association PAC ... Yet none of these contributions ever affect voting do they? Of course not. By Keith Cowing on March 7, 2007 9:08 AM. "China will launch its first lunar probe this year, and expects to be able to land a man on the Moon within 15 years, a senior space official has confirmed." By Keith Cowing on March 7, 2007 8:42 AM. "Commander Mark Polansky and members of Space Shuttle Discovery's STS-116 mission will visit NASA's Marshall Space Flight Center in Huntsville, Ala., Tuesday, March 6." Editor's note: Let's see if Bill Oefeleinshows up. Last week he missed a chance to visit Capitol Hill with the rest of the STS-116 crew (sans Sunita Williams who is on the ISS). "Oefelein was the pilot on board Discovery during the Dec. 9-22 mission, but did not visit Marshall Tuesday with other crew members." By Keith Cowing on March 6, 2007 5:55 PM. "Rep. Brad Miller (D-NC), Chairman of the House Committee on Science and Technology's Subcommittee on Investigations and Oversight, cancelled tomorrow's scheduled subpoena meeting concerning the investigation of NASA Inspector General (IG) Robert Cobb after reaching agreement with the President's Commission on Integrity and Efficiency (PCIE) to provide to the Subcommittee the requested report on Cobb by April 2, 2007." By Keith Cowing on March 6, 2007 1:35 PM. "A love note e-mailed to an orbiting space shuttle was one of the ways NASA astronaut Lisa Nowak learned she had a rival for astronaut Bill Oefelein's affections. Considered unemotional and shy, Nowak collected that e-mail and a dozen others showing her boyfriend had a new lover before she went on a bizarre, 969-mile odyssey last month to confront the woman in a parking lot at Orlando International Airport, according to documents released Monday." Reader note: "Keith: Not that this is huge news or anything, but I thought you'd be amused at how unsecure the "love letter" email PDFs are, the ones being talked about in the Orlando Sentinel and other outlets. There are a number of blacked-out bits that can be deleted by opening the PDF in Adobe Illustrator. Shipman calls her boss a jackass, and her and Oefelein's email addresses can be seen. Whoever is covering over the information in an attempt to hide it had no idea how to do it right. Again, probably nothing earth-shattering, but amusing." By Keith Cowing on March 5, 2007 9:45 PM. Editor's note: If you listen closely to the first part of this Microsoft Vista ad which aired in the U.S. and elsewhere in February 2007, you'll hear a faux 60's era astronaut reporting from "Freedom 7" as a Mercury Atlas rocket is shown on the TV. One small problem: Freedom 7 (carrying Alan Shepard) was launched on a Redstone rocket. Close enough for Microsoft, I suppose. Continue reading One More Reason Why I Use a Mac. By Keith Cowing on March 5, 2007 9:04 PM. Reader note: "Discussion at the Planetary Defense Conference in Washington today revealed that there are a variety of ways for NASA to meet the Congressional mandate to find 90% of the Near Earth Asteroids larger than 140 meters diameter by 2020. Not surprisingly, these options come with different costs attached. If we accept an 85% discovery goal by 2020, or if the goal is framed in terms of retiring 90% of the impact risk rather than finding 90% of the asteroids, it can likely be meet with a combination of two new-technology groundbased survey telescopes already planned. The Pan-STARRS survey telescope in Hawaii is being financed primarily by the U.S. Air Force, and the LSST in Chile by the NSF. NASA's direct costs to extract the asteroids from the data streams from these two telescopes might be as low as $10-$20 million per year." Continue reading Blinding Asteroid Scientists From Seeing Threats To Earth. By Keith Cowing on March 5, 2007 8:04 PM. "The cost to find at least 90 percent of the 20,000 potentially hazardous asteroids and comets by 2020 would be about $1 billion, according to a report NASA will release later this week. The report was previewed Monday at a Planetary Defense Conference in Washington." "Griffin complimented the thoroughness of the study. He stated that NASA is not funded to do anything more than the current detection program. Members discussed the origin of the congressional language and its intent. SMD Associate Administrator Mary Cleave suggested that NASA should not be in the business of building and operating ground-based telescopes but that portion of any program could be done in partnership with the National Science Foundation." Continue reading Planetary Defense - Just Send Money. By Keith Cowing on March 5, 2007 7:48 PM. "When Dee Riddle heard breaking glass inside her central Illinois home on Monday morning, she first thought a bathroom mirror had shattered. But what had broken was a bedroom window and what had caused it to break was an object that had fallen from space, scientists called in to investigate concluded." By Keith Cowing on March 5, 2007 11:58 AM. "China is aiming for its third manned flight next year with two astronauts making space walks, a state-run newspaper reported Monday. The Beijing Morning Post quoted Huang Chunping, chief consultant for China's manned launching vehicle system, as saying the Shenzhou 7 spacecraft would be ready this year." By Keith Cowing on March 3, 2007 12:24 PM. 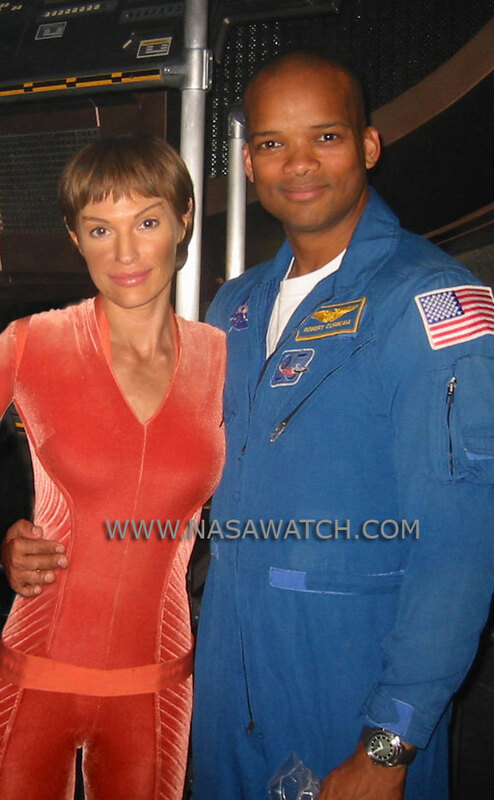 "Actress Jolene Blalock will join forces with renowned astrophysicist and New York Times best-selling author, Dr. Neil DeGrasse Tyson in honoring the 19th set of inductees into the Space Technology Hall of Fame. ... From 2001 - 2005 Blalock played Commander T'Pol on Star Trek: Enterprise and had a recurring role on Stargate SG-1 as Ishta in 2003 & 2004." By Keith Cowing on March 3, 2007 10:28 AM. "The Luddites have long opposed manned exploration as a waste of resources when, as the mantra goes, we have so many problems here on Earth. I find this objection incomprehensible. When will we stop having problems here on Earth? In a fallen world of endless troubles, that does not stop us from allocating resources to endeavors we find beautiful, exciting and elevating -- opera, alpine skiing, feature films -- yet solve no social problems. Moreover, the moon base is not pointless. The shuttles were on an endless trip to the nowhere of low Earth orbit. The moon is a destination. The idea this time is not to go to plant a flag, take a golf shot and leave, but to stay and form a real self-sustaining, extraterrestrial human colony." By Keith Cowing on March 2, 2007 2:35 PM. "NASA astronaut Lisa Marie Nowak, who allegedly made a nearly 1,000-mile trek to confront a woman she saw as a rival for another astronaut's affections, will not face attempted-murder charges, Florida prosecutors said on Friday. Instead, the 43-year-old Navy captain and mother of three will be charged with burglary with a weapon, attempted kidnapping with intent to inflect bodily harm, and battery." "Nowak flew on Discovery last summer and won praise for operating the shuttle's robotic arm. NASA relieved her of all mission duties after her arrest and placed her on a 30-day leave, which is up next Thursday." By Keith Cowing on March 2, 2007 8:46 AM. "Mechanical Visor Helmet worn by Gordon Cooper on his historic MA-9 Mercury Flight. This was purchased by me in 1995 by a reputable dealer. It was bought with the understanding that it was used by Cooper as his training helmet. I later came to realize that it was his flight helmet." Editor's note: Things like this (if it is what the seller claims it is) belong in the Smithsonian. By Keith Cowing on March 2, 2007 1:30 AM. "Bill Stone, leader of the NASA-funded Deep Phreatic Thermal Explorer (DEPTHX) mission, said the 2.5-meter-diameter vehicle performed "phenomenally well" during early February tests in the geothermal sinkhole, or cenote, known as La Pilita. Carnegie Mellon University researchers developed the software that guided the DEPTHX craft. ... NASA has funded the mission to develop and test technologies that might someday be used to explore the oceans hidden under the icy crust of Europa, one of Jupiter's moons." Editor's note: A very cool mission - one that embodies a synergistic overlap of science, operations, and exploration. And what does NASA PAO do? As has been the case with NEEMO: nothing. "You do not get Brownie points for having your name on a tombstone. You have to come back. With that in mind, I have actually taken a lot of cues from how NASA trains its astronauts when preparing for, and staffing, expeditions. In the subterranean world, where we are about to go, it is a gloves-off environment. The exploration front is now getting to the stage where it is so remote and so difficult to reach that no matter what technology we have at our disposal, and no matter how Olympically-trained and fit the people are who are involved with it, we still get stopped. Every time you go for four or five months in the field, if you're lucky, you're a kilometer or two deeper into the planet. I am going to try to give you an idea here just what this world is like. I'm going to show here what would be the equivalent of summitting Everest and K2, but it's all going to be in one continuous trip proceeding down, in order to give you a sequential feel for the logistics and remoteness." "StoneAerospace is a Texas-based company dedicated to the exploration and commercialization of the frontiers we know of and the discovery of the ones yet to come. We develop the tools needed to explore the frontier, to survive and work in it, to characterize it, and to exploit it." By Keith Cowing on March 1, 2007 10:20 PM. "GAO wanted NASA to rethink its decision to award the second part of the contract for Orion in September 2006. The contract was scheduled to continue through 2019, and GAO didn't think NASA had done enough research to make such a big commitment. There was a risk of cost overruns, schedule delays and overall poor performance, GAO wrote. If NASA did not reconsider its plans, then Congress should consider restricting its funding, GAO recommended. NASA officials disagreed. In their response letter, they said the agency had done enough preparation to proceed with the contract." By Keith Cowing on March 1, 2007 6:31 PM. "On 22 February 2007, John Connolly from the Lunar Lander Project Office at NASA JSC gave a dinner presentation at an AIAA dinner meeting in Houston. These charts were used as part of that presentation and contain an overview of the hardware being proposed for returning to the Moon plus some of the thinking behind how a lunar base might be established." By Keith Cowing on March 1, 2007 1:35 PM. [Former NASA General Counsel] Paul Pastorek, former president of the state's top school board, was chosen today as Louisiana's new superintendent of education. By Keith Cowing on March 1, 2007 12:21 PM. "NASA's Cassini spacecraft has captured never-before-seen views of Saturn from perspectives high above and below the planet's rings. Over the last several months, the spacecraft has climbed to higher and higher inclinations, providing its cameras with glimpses of the planet and rings that have scientists gushing. The images taken over last two months are being released today and include black and white and color mosaics, as well as a dramatic movie sequence showing the rings as they appeared to Cassini while it sped from south to north, rapidly crossing the ring plane." By Keith Cowing on March 1, 2007 12:20 PM. "NASA's Hubble Space Telescope took this true-color view of Jupiter in support of the New Horizons Mission. The image was taken with Hubble's Wide Field Planetary Camera 2 on February 17, 2007, using the planetary camera detector. Jupiter's trademark belts and zones of high- and low-pressure regions appear in crisp detail. Circular convection cells can be seen at high northern and southern latitudes. Atmospheric features as small as 250 miles (400 km) across can be discerned."